Portraiture photography is the art to take a photo in just the right moment, when all 26 facial muscles of the model create the perfect for the person matching expression. Don’t worry: Portraiture photography is an interesting area of photography, as people in general like to look at other people. In a nice story from Woody Allen, he says: “He cheated in the metaphysics exam – because he looked into his neighbors’ soul.” This says much. And thinking about it, it is for me the most important sentence for portraiture photography. In my opinion is not about just taking a picture of somebody, but about grasping the individual and the real person and managing to take a shoot of the moment they show up. Not in the style of a building examiner I met. He complained that none of his photos work. After looking at his photos it was clear why. He photographed people like buildings, for their documentation of their constructional defects. The photos were technically brilliant and not a single flaw was hidden. Of course, that topic is the hardest in portraiture photography – but before that let us look at the technic and its basics. These 4 perspectives reduce the eye contact with the photographer more and more. Frontal is direct eye contact with the camera. Profile means that the portraited person simply looks towards one side. The person can look very massive. Often photographers use a mix of frontal and half profile. The head looks frontal towards the photographer while the body is turned into a half profile. That way there is more dynamic in the picture. A desirable choice when the person you want to depict has different sized eyes. The small eye can be in the foreground and therefore appears bigger. Please care about, that the nose isn’t breaking through the outline of the face, what in general looks strange. can be very interesting when the person has a distinctive profile. If the 2 facial halves differ very much, then it is a good choice to only show 1 facial half per photo. Depending on the person the perspectives work and appear very different. Photographing somebody with a very distinct nose in profile has the result that the nose is presented clearly. Now it differs how the relationship of the model to its distinctive nose is. The frontal perspective reduces the effect of the nose on the picture. But it hasn’t to be the nose – the chin, the forehead or the eyes can be as distinctive or very small. Watch out for that and simply try all the perspectives yourself. Same rules here: Talk with the model, what he or she especially likes or dislikes about the own face. Always stay positive! The question, “What do you dislike the most about yourself?” destroys the mood and can influence the whole shooting negative – expect when you want to depict disgruntled people (would also match for choleric persons). We can also change the perspective onto the model. Interesting (also psychological) are the very different effects – here we can easily transport emotions with the pictures. This is approximately our „accustomed“ view of people, when you are around the standard height in your country. I.e. : This view is our most frequent view of other people, when we look other people in the eyes having a frontal talk. When you take pictures of a person from below, then the person seems bigger, sublime or under some circumstances snobbish (depending on the stretching of the neck). We “look up” to the person. That is the type of photo chief executives want to see, when they go to a photographer. For the same reason many oil paintings are attached above eye level, so that you have to “look up”. When taking a portraiture from above, we can generate a lot of emotions. We look down on somebody (Kids, servants (wrong century), pets or other submissive). This perspective is reality in some cases, for example as the standard height of men is taller than the height of woman. So if we depict a woman slightly from above, it can be equal to the common view of men (and as many photographers are men and seem to have knee problems or some of that sort) you will see a lot of portraits of woman like that. The perspective from above can also symbolize sadness or a bad conscience. The lowered gaze can mean in a normal discussion that the counterpart doesn’t want to look into your eyes. Try out the different camera positions and let the photo work on yourself. Which emotions do you have while looking at them? In following I will show the different possibilities of arrangement to influence the photo in portraiture photography with a mannequin. This has the advantage that the facial expression doesn’t change. Portrait from below or above also change the mouth, nose, eye and forehead area – these look different compared to the normal view in an “unusual” size – what can cause a refreshing impression. The neck looks, for example, from below much longer or from above much shorter. In the pictures above the eyes are always on the same height and nearly the same size, so that the difference can easier be seen. The used focal length of the objective is a factor you shouldn’t underestimate. The facial shape change depending on the focal length. You can see how it affects the face shape and the legs on the following picture. It is even easier to see when we use extremes like an 8 mm (Fisheye). That is the reason why a realistic portrait should be made with a focal length of 50 mm to 100 mm. The examples above were taken with a 35 mm camera – i.e. 35 mm format or with digital cameras you can speak of a full-format sensor. If your camera has a crop factor of, for example, 1,5 – then you basically get a section enhancement with your 50 mm focal length and not the optical characteristics of an objective with 75 mm (50mm * 1,5 crop factor). The interesting thing about objectives above 70mm is, that they have a small pincushion distortion. That means the portraited seems slimmer in the face. Many people like that effect, but if somebody already has very slim face, then this distortion can be unwanted. So please watch out for the perspective distortions! You can easily take a grotesque photo with a Fisheye objective. This will result in big noses, and, if photographed from above, a very small body. When using focal lengths above 150mm you can take photos where you magically achieve that the faces look very flat. There are some variations of image sections. The normal portrait, that you can might know from paintings mostly shows a picture breast and above. In modern times you get such a photo when photographing cross. Then there is always the question what can be seen left and right of the photographed person. One solution is to show the person in his natural environment – with the things that makes the person an individual and how the person defines itself. Portraiture Face: the face is picture-filling. Trimmed face: only the face is depicted – the background is in general not visible, as the face uses up the whole space of the photo. Detail: A detail is tuned out. This can be a very sensual mouth or very equal faces halves. You need longer focal lengths for to avoid casting a shadow on the portrait and to avoid getting too close. The focal length also influences the depth of field. 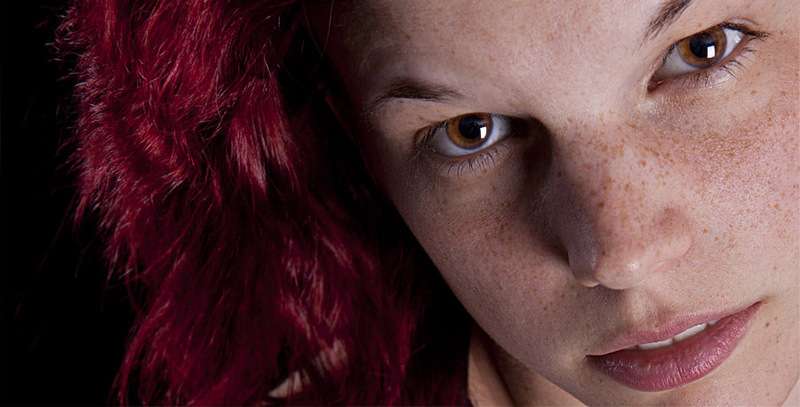 Extremely important in portraiture photography is that the eyes are depicted sharp. However, depending on the focal length, the depth of field might be quite small, so that when doing a half profile portrait one eye isn’t depicted sharp anymore. Care about that the eye closer towards you is sharp. The forehead and the mouth can be blurred, but at the eyes should be depicted sharp. Of course, you can break this rule, this is artistic freedom, but you should do that on purpose and not ex ante to justify a bad photo. The correlations for depth of field between aperture value, focal length and distance are explained in the chapter: „Depth of Field in Photography“. The liveliness of the eyes is caused by light points from light sources. When they miss, eyes rapidly look lifeless. Sometimes this feature is used in films to increase the effect of the evil mastermind – the producer either cares about that while shooting or removes it in post-production, so that the eyes of the evil mastermind doesn’t have light points in their eyes. You achieve these glossy light points through reflected light of windows, candles or other light sources. As soon as you use flashlight you can position these light points. It is very funny to see, for example, on many election posters you can see the reflectors and their shape (often rectangular) in the eyes of the candidates. Special highlights are portraits, where you can see in one eye a rectangular light reflex, while the other eye shows a round light reflex. Amusing – just take a look! This also explains why we sometimes have a strange impression when looking at some portraits. The light point should be natural. Often the point can be located up in the eyes (from where the sun, in general, shines) and is round. Test to let the light fall from the right side onto a face. Often you read in various photo books, that you should find the “chocolate side” of a person. In one I read that you simply need to care about the hair parting. The side with the parting is the photogenic one. But as long as I haven’t tried it on a thousand people, I doubt it. Interesting are 2 attempts, which explain, that the key-light (main light) should fall onto the right facial half. One argumentation was that the normal westeuropean reading direction is from left to right and people feel more comfortable going from light to dark picture areas. A different explanation is, that the task of the left facial half is emotions, and through the wiring, affects the right facial half. In that explanation this is the reason why the right facial half can express emotions better and is therefore more interesting. Maybe it is about the type of person (left handers). But it is always interesting to observe. One single key-light should be set (or should be set with the flash). This appears most natural. Try taking photos with various positions and a single light source. If the light source comes from below, then the portrait already seems very mystical. You can achieve some very nice effects and portraits through a focused placement of the lights. As this is a vast point, it has its’ own chapter. What you can clearly observe in photo courses is that all the participants compete how silent they can be. The model then has 2 possibilities – do her own program or simply do nothing. But, a model can’t judge, if for there is the right light for a pose and if it looks good from the view point of the photographer. Talk with the model, tell the model what you want and when the light is perfect. 2)	Talk even more with your model! Yes, and another yes. Talk, talk, talk. And never forget praising. The more comfortable the model is, the better the photos will get. The emotions of a model are later on depicted on the photo (the anger under some circumstances also) and also equally fatigue. Even if point 3 seems to contradict the 2 points before – it doesn’t do that! Keep silent about unwished or bad results! When you control your own picture, you should keep silent over any own bad results and your anger (mostly about yourself) about it and just change your settings till they fit. Nothing is more irritating for a model then a photographer, who grumbles. The model might think the resentment is about her. In the beginning test photos are always necessary. And they are there to make errors, so that you can still adjust everything that the settings, positions and lights fit when the “real” photos are taken. So please keep silent. Even when a pose or idea simply doesn’t work, take some shots and change to the next idea. Nothing is worse then sentences like “this doesn’t work with you”. Sometimes after that the shooting is down the drain (and some photographers don’t even recognize it). If you want the model to make a pose, do it yourself to show what you mean. Never ever touch the model.